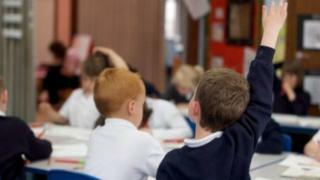 Talks to try to avert a strike ballot by Scotland's largest teaching union have ended without agreement. The EIS said there were no further talks planned and it would continue to prepare for a strike ballot next Monday. The union said it was disappointed an improved pay offer was not made. The union previously rejected a pay offer which would have seen a series of rises worth 9% by April and a further 3% next year. Councils and the Scottish government have previously described the pay offer as the best in the public sector in the UK. Monday's meeting brought together unions and representatives from councils and the government. The EIS wanted teachers to receive a 10% pay rise last April. Following the latest talks, EIS general secretary Larry Flanagan said: "Regrettably, no new offer was made and so the EIS will continue moving towards a statutory strike ballot which will open on Monday next week. "The lack of any new offer is unfortunate, following last week's more positive discussions. "It will be disappointing if the Scottish government and Cosla spurn the opportunity to avoid industrial action, but once again it looks as though EIS members are going to have to demonstrate just how deep the discontent within Scottish education has become." He added that although pay was one issue for teachers, excessive workloads, a lack of support for teachers with pupils with additional support needs, paperwork, growing class sizes, a lack of resources and teacher stress were also factors in the decision to take action. "No-one wants industrial action, but Scotland's teachers feel compelled to make a stand," Mr Flanagan said. A Scottish government spokesperson said: "We look forward to continuing discussions as we work together with all interested parties to put in place the fair pay rise that teachers deserve." Mr Flanagan said that although no further talks were currently planned, the union "would be available to meet at any point to work towards a negotiated agreement." Cosla's resources spokeswoman, Councillor Gail Macgregor, said: "We absolutely value the education of our young people and throughout these negotiations have reiterated the value we place on our teachers and the work that they do. "That is why we remain at the table and that is why we remain hopeful of a resolution." Last week, Education Secretary John Swinney told an EIS conference he wanted to work to address concerns teachers had over issues such as their workload. The EIS has pencilled in the day before exams start in April for a strike. Before the union can call a strike, the vote would need to be overwhelming - a simple majority would not be sufficient. The turnout would need to be at least 50% while at least 40% of those entitled to vote would need to support going on strike.